Find the entry with the date of your program, and the name of your guide. Splendors of the Universe on YOUR Night! Many pictures are links to larger versions. Click here for the “Best images of the OTOP” Gallery and more information. Cassiopeia is widely recognized by its characteristic W shape, though it may look like an M, a 3, or a Σ depending on its orientation in the sky, and your position on Earth. However it’s oriented, once you’ve come to know its distinctive zig-zag pattern, you’ll spot it with ease. The plane of the Milky Way runs right through Cassiopeia, so it’s full of deep sky objects—in particular, a lot of open star clusters. Cassiopeia is named for the queen form Greek mythology who angered the sea god Poseidon when she boasted that her daughter Andromeda was more beautiful than his sea nymphs. Cygnus is a large constellation, prominent in the Northern Hemisphere. Its name comes from the Greek for “Swan” and can be imagined as a giant, celestial swan, flying overhead, with its wings fully extended. The brightest star in Cygnus is Deneb, which is one of the brightest stars in the sky, and a whopping 800 lightyears away! Deneb is one point of an asterism called the Summer Triangle—three very bright stars that form a large triangle shape prominent in the Northern hemisphere summer skies. Lyra is a small, but notable constellation. It is host to Vega—the fifth brightest star in the sky (or sixth, counting the Sun). Not far from Vega is Messier object 57—the Ring Nebula, which is perhaps the best known planetary nebula in our sky. Lyra’s name is Greek for lyre—a kind of harp. This constellation is named for one of the most beloved creatures of Greek mythology—the winged horse named Pegasus. Within Pegasus is a well known asterism containing the 3 brightest stars in the constellation (+ 1 in Andromeda) called The Great Square of Pegasus. Alpheratz, the brightest star in the square, actually belongs to the constellation Andromeda, but in the past, this star had been considered to belong to both constellations. M15 is a distant globular cluster, 33,000 light-years away. It has 100,000 stars, and is one of the oldest known globular clusters, having formed about 12 billion years ago. Quick streaks of light in the sky called meteors, shooting stars, or falling stars are not stars at all: they are small bits of rock or iron that heat up, glow, and vaporize upon entering the Earth’s atmosphere. When the Earth encounters a clump of many of these particles, we see a meteor shower lasting hours or days. That clumpy band of light is evidence that we live in a disk-shaped galaxy. Its pale glow is light from about 200 billion suns! Human technology! There are almost 500 of these in Low Earth Orbit (we can’t see the higher ones). We see these little “moving stars” because they reflect sunlight. Messier 52 is an open star cluster, which was discovered in 1774 by Charles Messier. The density near the center is about 3 stars per cubic parsec. The cluster is only 35 million years old—very young for stars. The distance of this cluster from our Solar System is not very well known; estimates range between 3,000 and 7,000 light-years. M52 can be seen as a nebulous patch in a good pair of binoculars or a small telescope. In larger telescopes, it appears as a fine, rich, compressed cluster of faint stars, often described as of fan or “V” shape. M52 can be found by extending the line from Alpha over Beta Cassiopeiae by 6 1/2 degrees to the NW to 5th mag 4 Cassiopeiae; M52 is roughly 1 degree south and slightly west of this star. M57: The Ring Nebula. This remnant of a dead star looks exactly as it’s name says – a ring or doughnut shape cloud of gas. The nebula is about 2.6 lightyears across and lies about 2,300 lightyears away. The same side of the Moon always faces Earth because the lunar periods of rotation and revolution are the same. The surface of the moon is covered with impact craters and lava-filled basins. The Moon is about a fourth of Earth’s diameter and is about 30 Earth-diameters away. Uranus, the seventh planet from the Sun, was discovered by Sir William Herschel in 1781. It has a dark set of rings and at least 27 moons. Uranus’s axis of rotation is almost 90 degrees from those of the other planets, as if Uranus has been tipped onto its side. Named long before anyone knew it was more than one star, Albireo (β Cygni) comprises of a set of stars marking the beak of Cygnus, the swan. 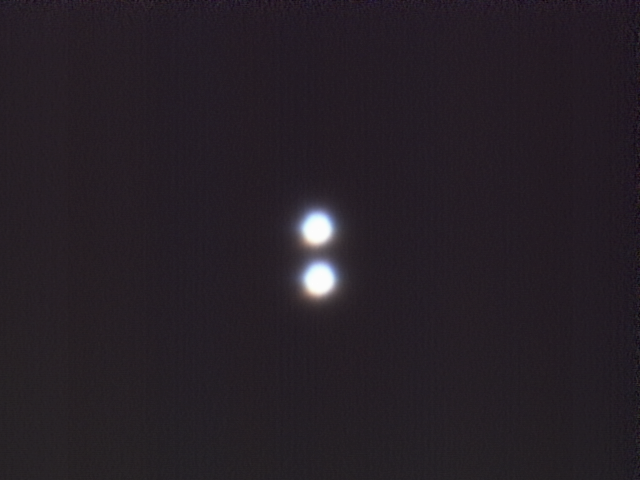 Through a telescope, we see two components shining in pale, but noticeably contrasting colors: orange and blue. The difference in color is due to the stars’ difference in temperature of over 9000°C! The brighter orange component, Albireo A, is actually a true binary system, though we can’t resolve two stars in the telescope. The fainter blue component, Albireo B, may be only passing by, and not gravitationally interacting with Albireo A at all. Albireo is about 430 light-years away. Mesarthim is one of the brighter stars making up the constellation Aries—the ram. It is actually a pair of stars—a double star—204 light-years away. It’s component stars are of similar brightness and both white. They are separated by about 500 times the distance between the Earth and the Sun, and take approximately 5,000 years to orbit each other. The apparent (slightly) dimmer star, Gamma-1, is actually the hotter and more luminous star. Much of its light is ultraviolet, and invisible to human eyes. The apparent (slightly) brighter star, Gamma-2, has some interesting characteristics that suggest not only that it may be evolving from a dwarf to a subgiant, but also that it is highly magnetized. Your Telescope Operator and Guide. Thank you for joining me this evening! See you soon!! the Overnight Telescope Observing Program. For more information on this unique experience please visit Overnight Telescope Observing Program.